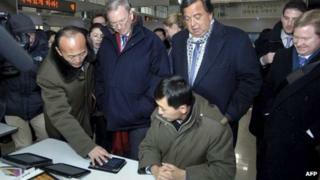 Google Chairman Eric Schmidt has urged North Korea to end its self-imposed isolation and allow its citizens to use the internet. Speaking after a visit to Pyongyang, he said North Korea would continue to lag economically unless it embraced internet freedom. He was part of a US delegation led by former state governor Bill Richardson. Mr Richardson, also a former US envoy to the UN, has visited North Korea several times in the past, most recently in December 2010. On two occasions he helped secure the release of detained US nationals. Media captionBill Richardson: "We strongly urge the North Koreans to proceed with a moratorium on ballistic missiles"
Speaking at a media briefing in Beijing after arriving from North Korea, Mr Schmidt said he had been in Pyongyang to discuss a free and open internet. Internet use is highly restricted in North Korea - few people have access to a computer and most users can only access a national intranet rather than the world wide web. "As the world becomes increasingly connected, their decision to be virtually isolated is very much going to affect their physical world, their economic growth and so forth, and it will make it harder for them to catch up economically," he said. "Once the Internet starts, citizens in a country can certainly build on top of it. The government has to do something. It has to make it possible for people to use the internet which the government in North Korea has not yet done." Mr Richardson said the delegation had raised the case of detainee Korean-American Kenneth Bae, who was arrested in November in circumstances that are not clear. North Korea has in the past released detained Americans after high-profile US visits, but Mr Richardson said he had been unable to meet Mr Bae. "We strongly urged the North Koreans to proceed with a moratorium on ballistic missiles and possible nuclear test," he also said. The delegation's Pyongyang trip comes less than a month after North Korea put a satellite into orbit using a three-stage rocket - a move condemned by the US as a banned test of long-range missile technology. The US government has described the visit as "not particularly helpful". "We continue to think the trip is ill-advised," US State Department spokeswoman Victoria Nuland said on Monday.